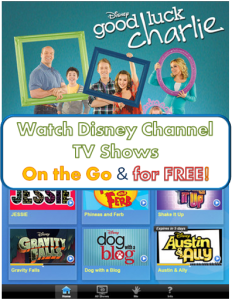 Do you know you can watch Disney TV shows on the go for FREE? No subscriptions needed. With the free apps, Watch Disney, Watch Disney XD, Watch Disney Junior, you can watch the Disney shows on your iPAD, iPhone, or iPod, or any Kindle devices. You can also watch them on your computers. All you have to do is to download the apps and start watching the shows. It is only available in the US and its territories. You need internet connections, either via WiFi or 3G/4G connection. If you are not a Disney channel subscriber, you can watch full-episodes 30 days after they air. It is through the live stream, each episode is only available for certain time period. But there are always two full episodes available for each show. If you are a subscriber, you have access to additional features, such as “Live” programming and Video-on-demand (VOD) full-episodes the very next day after they broadcast on TV. Disney: A.N.T. Farm, Austin & Ally, Dog with a blog, Jessie, Gravity Falls, Good luck Charlie, Phineas and Ferb, Shake it Up. All three apps are available for iPhone, iPod and iPAD for FREE. They are also available for Kindle devices, but not for other Android devices. Don’t have any of the devices? No worries – you can access all the free shows on your computers. To watch on computers: start on their web site. I got this website from my buddy who informed me concerning this web page and at the moment this time I am browsing this web site and reading very informative articles at this time. It is great you find useful info here. Hi there would you mind sharing which blog platform you’re using? I’m going to start my own blog in the near future but I’m having a difficult time choosing between BlogEngine/Wordpress/B2evolution and Drupal. The reason I ask is because your layout seems different then most blogs and I’m looking for something unique. What a great app! So helpful! They are great, aren’t they. Now even I will watch some of the shows – just to stay updates on kids stuff.